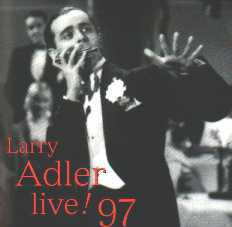 Recorded live at the Brisbane Concert Hall, 18th April 1997, this CD captures a phenomenal performance by the remarkable Larry Adler, who is now celebrating 75 years in show business. Compare this live rendition of the Genevieve Waltz with the 1953 movie soundtrack version, or Gershwin's Rhapsody In Blue with Adler's 1935 recording, and you'll find he is still an undisputed virtuoso of the mouth organ (as he prefers to call it). For this concert, Larry Adler was accompanied by Musical Director and pianist Bernard Walz, winner of the 1996 and 1997 Australian Entertainment "MO" award for Variety Instrumental performer of the Year. Walz shows great sensitivity in his playing, as do the other outstanding Australian musicians, double-bassist Craig Scott and drummer David Jones, who appear on several songs. Adler's repertoire ranges from the American legends Cole Porter and Duke Ellington, to the classical masterpieces of Beethoven and Ravel. His lively anecdotes extend from the heyday of Hollywood to Hitler's balcony, where in 1945 he played the Battle Hymn of the Republic while Ingrid Bergman recited the Gettysburg Address. That moment is recreated here, thanks to a recording of Bergman's voice, while part of Rhapsody In Blue features a piano roll transcription of Gershwin himself at the keyboard! The inclusion of Adler's witty narrative, supplements the "live" atmosphere of the recording and illustrates the magic of an era, without ever delaying too long, the wonderful music that follows.